In Northern England the helicopter buzz flights take place from March to November – approximately every two or three weekend days per month. For the nationwide buzz flights, these take place from April to October – approximately one weekend day per month. 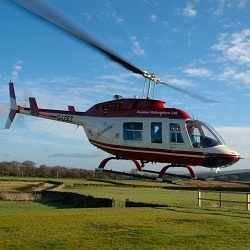 Our helicopter buzz flights are perfect for those looking for a short helicopter experience around a local area. Upon arrival at your chosen site you will be ‘checked-in’, followed by your flight safety briefing before being taken to the helicopter for a trip of a lifetime. There’s nothing like the feeling of a helicopter take-off whilst soaring into the air, watching the ground running along beneath you as you climb to around 1,500 feet taking in the incredible views! After the flight you will receive a souvenir flight certificate to prove you have done it! A helicopter buzz flight makes the ideal present at any time of the year, a treat for yourself and loved ones or an incentive prize.